Chingy who hails from the Midwest has the whole St. Louis riding with him on his third album, "Hoodstar." The production on this album will bang in your speakers, with production from the likes of Poli Paul, Timberland and Jermaine Dupri to name a few. Unfortunately there's no substance to this album, just thirteen tracks of clubbing till morning, "Nike Aurr's & Crispy Tees," and dare not another album have the words, "lean wit it, rock wit it." 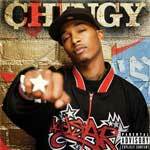 At times, you will be impressed with Chingy's flow, he does venture a few times from his signature sing-songy style of rap. "Cadillac Door" has Chingy showing his caring side. He dedicates it to those who lost a loved one on 9/11, in Hurricane Katrina, or anyone who's experienced being down. "Dem Jeans" and the lead single, "Pullin Me Back" featuring Tyrese are both catchy songs. But "Hoodstar" as a whole will likely be a hit among the younger fans, and not amongst those looking for substance.